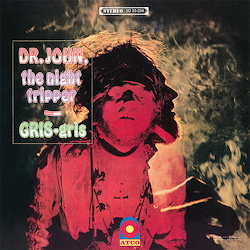 "Gris-gris" - Dr. John (voc, keyb, perc), Harold Battiste (b, cl, perc, arr); Plas Johnson (sax); Lonnie Boulden (fl); Steve Mann (g, bjo); Richard Washington (perc); Bob West (b); John Boudreaux (dr); Mo "Dido" Pedido (cga); a.o. ﻿His grandmother is purported to have transported objects using her spiritual powers and it is said that she sometimes floated through the room. Her grandson Malcolm Rebenneck was fully aware of his unique features when he appeared under the name of Dr. John, a voodoo healer in the 19th century, and was the first person to transcend from pitch-black spheres to psychedelic music as its high priest, so to speak. In the seven magical musical numbers of "Gris-gris", the root doctor conjures up a potent mixture of creole melodies, primeval heathen sounds, a pinch of mardi-gras and New Orleans jazz and even undreamt-of sounds. "Gumbo Ya Ya", a dragging procession with archaic sing-song, shows that suggestive Afro sounds are what rule in this album. And to play with them, to soften them here and there, or to enhance them with dance-like expression and voices from afar ("Danse Fambeaux") is all part of the programme in this collection of artistic treasures. In between raspy sounds there are flattering, intimate tones such as the springy, gentle and forward-looking "Croker Courtbullion". The equation Witchcraft = Masterwork certainly applies to this unrivalled album, which is listed at No. 143 in the 500 Greatest Albums of all Time by the magazine Rolling Stone.